Biodiesel is a clean burning methanol (mono-alkyl) ester or ethanolester based fuel made from vegetable or animal fats. Biodiesel contains no petroleum, but it can be blended at any level with petroleum diesel to create a biodiesel blend. It can be used in compression-ignition (diesel) engines with no modifications. Biodiesel is simple to use, biodegradable, non-toxic, carbon neutral and essentially free of sulphur and aromatics..
Biodiesel is non-toxic. Biodiesel is the only alternative fuel in the US to complete EPA Tier I Health Effects Testing under section 211(b) of the Clean Air Act, which provide the most thorough inventory of environmental and human health effects attributes that current technology will allow. The acute oral LD50 (deadly doses for 50% of all test animals) is larger then 17.4g/kg bodyweight. The LD50 for table salt (NaCl) 3-4g/kg of bodyweight, indicating that biodiesel is approximately 5 times less toxic than salt. A 24 hour testing shows undiluted Biodiesel producing fewer skin irritations when compared to 4% lye of dissolved soap in water. Flash point is measured in degrees at that point, when open fire or sparks ignite a certain matter. The flash point of biodiesel is at 200°C much higher (therefore safer) when compared to that of mineral diesel. Thus, storage, transport and handling of Biodiesel are cheaper and less dangerous than mineral diesel. Biodiesel degrades about 4 times faster than mineral diesel. Within 28 days pure biodiesel solved in water will be degraded by 85 to 88 per cent - the same as dextrose. Blending biodiesel with conventional mineral diesel enhances degradability of mineral diesel significantly. For example B20 (20% Bio-, 80% Mineral diesel) is degraded 2x faster than 100% mineral diesel. 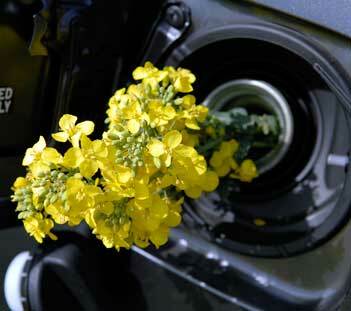 Biodiesel is rated s "generally not harmful" by the National Institute of Safety and Health. The deadly doses of Biodiesel on the basis of bluegill in 96 hours of testing was larger than 100mg/l.